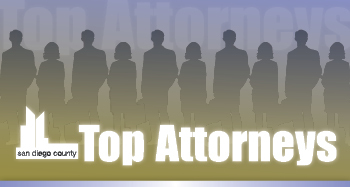 Congratulations 2013 Top Attorneys finalists! Thank you to everyone who participated in the nomination process — we received more than 800 nominations among the 15 pre-selected categories this year. Each attorney will be asked to nominate a lawyer (solo, in-house, firm, government, academic) that they have had experience within a professional setting. We will need to collect information about each lawyer making the nomination and the person they are nominating. The Daily Transcript will need the name, firm/company, phone and e-mail of each party. Each lawyer will be required to tell us why they are nominating the attorney in 500 words or less. Don�t miss out on this wonderful opportunity to recognize your peers or congratulate attorneys from your firm. Highlight your firm�s expertise by advertising or sponsoring Top Attorneys 2013. Call 619.232.4381 or email contact@sddt.com to get more information today!